At least 13 people have died and nearly 150 have been hospitalised in central Cambodia after drinking the contaminated liquid, health officials said Monday, blaming either home brewed rice wine or water. 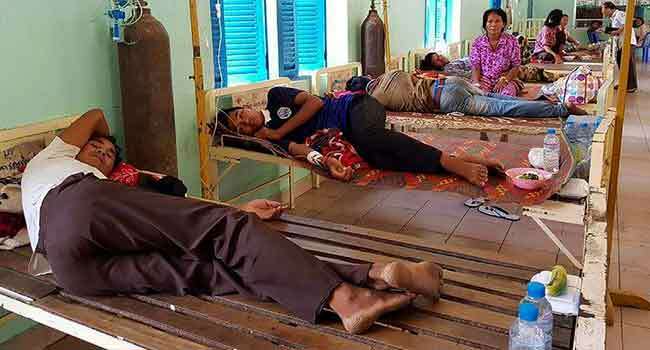 The deaths began on May 3, rocking two villages in the poor, rural Chet Borey district of Kratie province. “As of today (Monday) 13 people have died,” Chheang Savutha, provincial health director, said. “We don’t know what cause is of the incident yet, we are working on that now,” he added. The Ministry of Health said samples from local rice alcohol found high levels of methanol, which can be very toxic. But officials were also awaiting test results from water samples. The ministry warned villagers to stop drinking rice alcohol and to take extra care over the hygiene of their food and water. Cambodia is one of Asia’s poorest countries and health and safety standards are virtually non-existent outside of the major cities.